At least one-third of the people we know are introverts. They are the ones who prefer listening to speaking, reading to partying; who innovate and create but dislike self-promotion; who favor working on their own over brainstorming in teams. Although they are often labeled “quiet,” it is to introverts that we owe many of the great contributions to society–from van Gogh s sunflowers to the invention of the personal computer. Passionately argued, impressively researched, and filled with indelible stories of real people, “Quiet “shows how dramatically we undervalue introverts, and how much we lose in doing so. Taking the reader on a journey from Dale Carnegie s birthplace to Harvard Business School, from a Tony Robbins seminar to an evangelical megachurch, Susan Cain charts the rise of the Extrovert Ideal in the twentieth century and explores its far-reaching effects. She talks to Asian-American students who feel alienated from the brash, backslapping atmosphere of American schools. She questions the dominant values of American business culture, where forced collaboration can stand in the way of innovation, and where the leadership potential of introverts is often overlooked. And she draws on cutting-edge research in psychology and neuroscience to reveal the surprising differences between extroverts and introverts. THIS BOOK IS SO IMPORTANT! Extroverts, introverts, ambiverts, and those who don’t know where they fit in LISTEN UP! You should read this book, and if you really don’t want to read this book… well fine I can’t force you, but I urge you to do a little research of your own on your own ‘vert’ as well as your opposite. It’s a little bit easier for an introvert to understand why an extrovert is the way they are, but I feel like it’s harder for extroverts to understand introverts, and this book will do just that. If it wasn’t painfully obvious by now, I’m an extreme introvert. In the beginning of this book there’s a true or false sort of test that the more you answer true the more introverted you are, the more false the more extroverted, and a healthy mix would make you an ambivert – which is someone who shows both introverted and extroverted traits and is something I learned from this book that I didn’t know before, so that’s winning! #knowledgeispower … but I digress. So I answered almost every single question true, ergo I am introverted to almost maximum level. I used to think this was a bad thing, but after this book I’m ready to celebrate my quirky introvert habits. 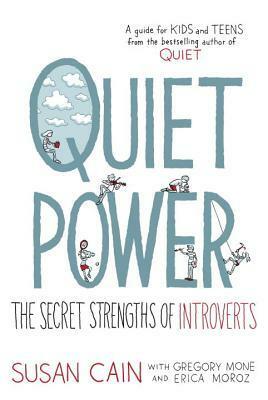 And that’s why this book is so important, it helps you understand introverts if you aren’t one, and it will help introverts understand themselves and be proud. This book is geared toward teens, most of the kids interviewed are from middle school or high school, but that didn’t stop me from taking away so much from it. Sometimes social life can be just as dramatic as an adult as it is for a teen in High School. However, I wish I had something like this when I was in High School, so if you’re reading this and you are a teen, have a teen, or know a teen that needs more confidence or tolerance, please give them this book! I know I said it already but I’m going to say it again: THIS BOOK IS IMPORTANT! It’s a really quick, informative, and touching read. I gave it 5 really important stars, and I hope more people can give this book a shot. Oh, interesting! I was wondering if this was different from QUIET, so I guess they’ve made a teen version. That seems to be becoming increasingly popular with nonfiction.